We've just been away for a few - extremely chilly - days in our motorhome. We went to the Cotswolds, which are only a couple of hours' drive away from us. Beautiful villages and countryside, and the campsite was as clean and well organised as we could wish. We were able to keep very warm and toasty inside our motorhome, but golly, it was really cold outside. This photograph was taken just after we started. Ruby didn't seem to realise that she could lie down on the seat and rested her head on the table in a rather resigned and uncertain sort of way. She actually enjoys coming in the motorhome with us, and will sit out there for ages whilst we're packing up ready to go. Normally she sleeps on the floor, on a blanket, but this time there were a lot of draughts coming in which we don't normally notice when the weather is warmer, so she got very cold and ended up sleeping on the bed. Happy dog, rather sleepless people! The thought of all three of you snuggled together on the bed is so sweet. Glad you were able to have a nice family outing. We did get to see the Cotswolds when we were in England. I believe that's when we first experienced the English breakfast. Our kids fell in love with that certain special high calorie toast. 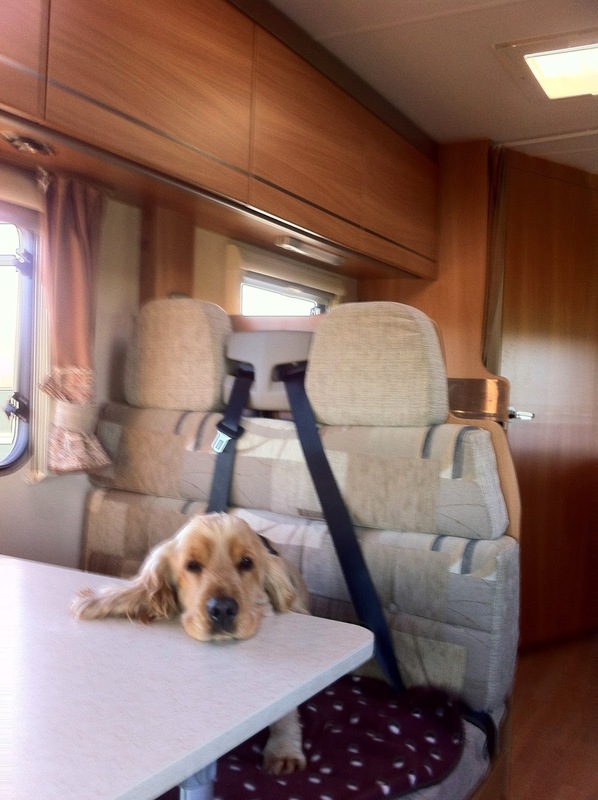 How wonderful to have a motorhome. That sure makes traveling much easier and more convenient. And I LOVE that photo of Ruby!! !